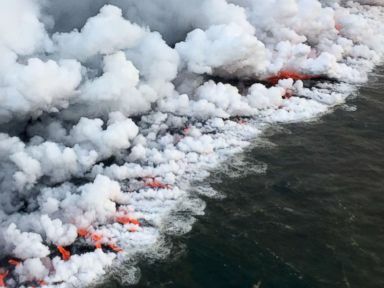 An 18th fissure began spewing magma on Sunday as officials in Hawaii warned of the possibility for an "explosive eruption" as lava continues to withdraw from the summit lake at Kilauea. Hawaii's Civil Defense Agency announced an 18th fissure had opened Sunday on private property in the Lanipuna Gardens neighborhood. Overhead video showed homes just a short distance from where the earth had cracked open. "Continued earthquake activity and additional outbreaks in the area are likely," the Civil Defense Agency warned in its 6 p.m. local time (midnight Eastern time) update. Hannique Ruder, a 65-year-old resident living in the Leilani Estates subdivision, walks past the mound of hardened lava while surveying the neighborhood Friday, May 11, 2018, near Pahoa, Hawaii. Two new fissures -- the 16th and 17th -- had cracked open during the day Saturday. 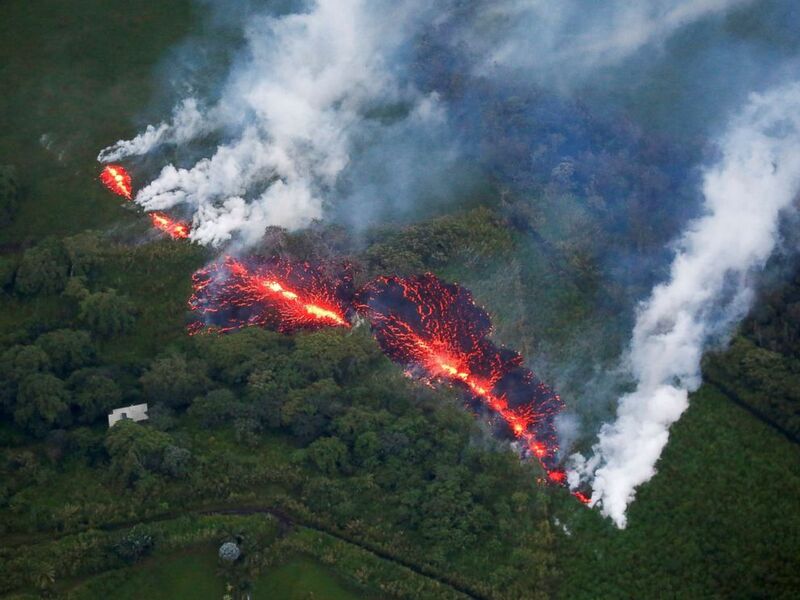 Both fissures were located in the lower East Rift Zone, east of the Puna Geothermal energy plant and northeast of homes in the Lanipuna Gardens subdivision. The Kilauea volcano first erupted April 3, sending toxic gases into the Big Island's atmosphere and eventually leading to more than a dozen cracks opening in the neighborhoods of Leilani Estates and Lanipuna Gardens. Lava erupts from a fissure east of the Leilani Estates subdivision during ongoing eruptions of the Kilauea Volcano in Hawaii, May 13, 2018. In this Friday, May 11, 2018 photo released by the U.S. Geological Survey, an ash plume rises from the Overlook Vent in Halema'uma'u crater of the Kilauea volcano on the Big Island of Hawaii. Vacation rentals in lower Puna were asked to "cease operations to relieve the demand for water" and in order to decrease the number of residents in the area. Officials already said last week they had moved flammables from Puna Geothermal uphill in case anything starts flowing near them. 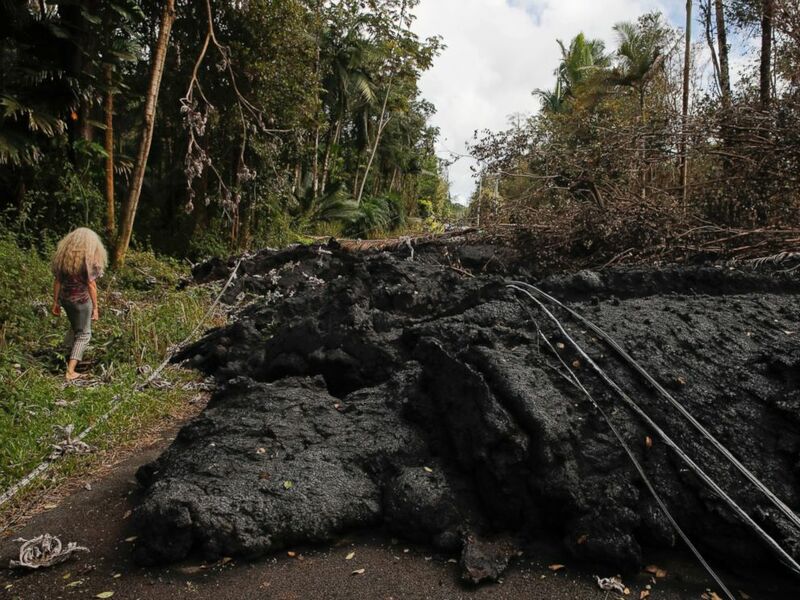 The agency said activity from the 16th fissure, which is located in a mostly forested region away from homes, was "minor" and "no significant lava flow was issued from this area." In addition to the new fissures, officials with the Hawaiian Volcano Observatory were concerned another volcanic eruption could occur on Kilauea. 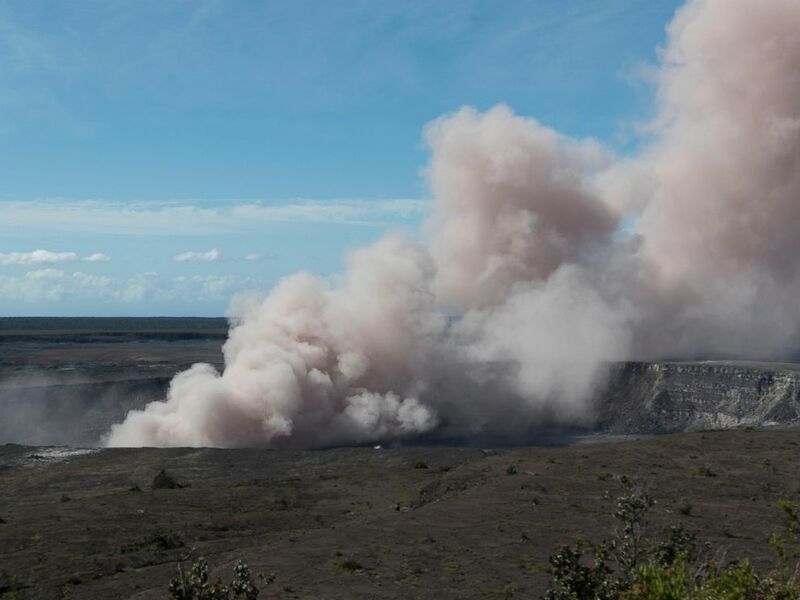 "HVO has cautioned about the possibility of an explosive eruption at Halema’uma’u Crater due to the ongoing withdrawal of lava from Kilauea summit lake," the Civil Defense Agency said in a statement. "This could generate dangerous debris very near the crater and ashfalls up to tens of miles downwind." President Donald Trump declared a major disaster in Hawaii on Friday in order to open up federal funding for those on the island affected by the volcano's eruption. At least 35 structures, including two dozen homes, have been destroyed since the beginning of the volcanic activity 10 days ago.